The theme of this post is GREEN. Ravelry is GREEN! In case you haven't been able to keep up- and I spend about six hours a day on this and don't keep up as well as I'd like- we've raised over $50K for Ravelry in the last few days. The response to Ravelraiser has been overwhelming. We bought the server, and then went on to erase Ravelry's startup debt to put them in the black, and then Casey put Ravelry "in the green" by contributing to projects that build and maintain renewable energy resources in order to offset Ravelry's carbon costs. If you gave to Ravelraiser, please do post your story in the Why I Gave thread. It is officially Jess's happy place now! 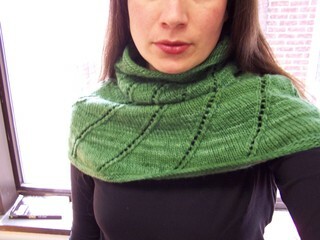 I celebrate Ravelry's greenness with my completed Balsam! 2 hanks Malabrigo Worsted in Verde Adriana, Raveled here. Speaking of GREEN, my dad, who is a pro photographer, and I are thinking of making a little of it. He took most of the photos in the Flickr set for the Ravelraiser prizes, and is becoming quite the yarnie. Texture, color, yarn that looks like food- he's reading up on it all (he may be in your Flickr sets RIGHT NOW!). He comes over to our house and steals the Ravelraiser packages before I can even get home. (The postman has given us our own little basket under the mailbox, as we were getting so many packages each day.) Yesterday he made a little groaning noise over some Malabrigo. Yep. My dad. So we're thinking of going into the notecard-making business. More on this to come! I celebrate this new venture with my Tudora! Less than one hank Malabrigo Worsted, Forest. Raveled here. 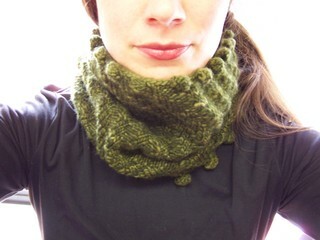 Oh- did I mention that all these are GREEN cowls? (You can argue with me about the Tudora, but I will stick my fingers in my ears and hum La Marseillaise and go to my happy place where all non-dangly neckwear has one name.) Yes, I'm still knitting cowls. 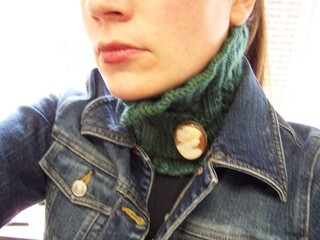 And making Flickr groups for cowls (come join!). And moderating Ravelry groups for cowls (git yer 'tocks in there!). And soon to come- cowl swap, which will be organized through that Ravelry group. (Didn't I tell you to join?) And to add a lovely exclamation point, I present my Aibhlinn. A tad more than one hank of Malabrigo Worsted, in Olive. (I modified the original pattern to be a one-skein-er.) Raveled here. And on a side note- I LOVE BOBBLES! Sorry, Kermie. It's SO easy (and fun!) being green today. It's a year this month since I joined Ravelry, and like so many things including Netflix, my yarn winder and swift, and cabling without a cable needle, I don't know how to picture my knitting life without it anymore. Between keeping up with what my friends are knitting and queuing, finding the just-right pattern to go with some mystery stash find, and watching radar when I really should be grading papers, Ravelry has proven over and over to be my best resource, a bubbling well of inspiration, and a place I always can count on to leave the light on for me when I need somewhere to go. 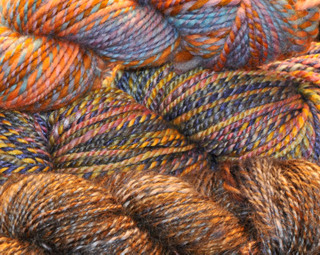 To make a long story short, I was hanging out with my pals in the Ten Lousy Bucks group when it occurred to me that it might be time to give Ravelry a boost. A call to Jess and Casey confirmed that a new server is on the wish list- we're loading them up with good data that needs a home. I emailed around a bit and received my first donation- two hanks of handspun from Jared of Brooklyntweed. And from there it yarnballed into RAVELRAISER '08! 1. Make a donation through the button atop this thread on Ravelry between now and APRIL 25 (please note date change!!) and include the word "Ravelraiser" in the comments box. (See how to do that here.) If you use the special button above it won't matter as much, but it's still helpful. 2. Each $10 donation wins you one chance at fabulous prizes! Therefore, a $30 donation would win you three "tickets in the hat." 3. 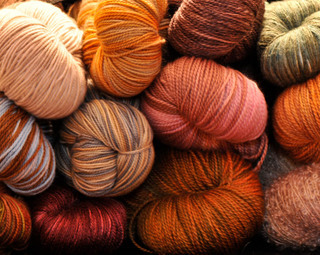 If you are allergic or averse to wool, you may write "cottons" in the comments box as well. This will mean that your name will only be added to the drawings for non-wool prizes. Due to my desire not to overload Casey and Jess with extra work, no other special prize "requests" can be honored. 4. Jess and Casey will draw winners at Maryland Sheep and Wool on May 3! I will keep a running thread about them here in the Ten Lousy Bucks group- feel free to come by and oogle and comment! In addition, there is a Flickr set full of gorgeous photos to drool over and links to explore. Donors are highlighted in this thread. The four "Grand Prizes" are "Dream Stashes." 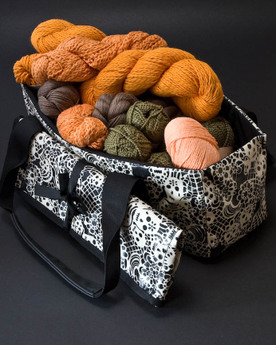 Cottons Stash, including Lexie Barnes knitting bag! Ravelry swag donated by Jess and Casey themselves! If you are a spinner or dyer and would like to contribute a prize, please contact me! The more winners, the merrier, I say! I'll be updating the Flickr set and Prizes Thread often. I have high hopes for this fundraiser. Is there anything that isn't clear? Any way you think it could be improved? Donations you'd like to offer? Places to advertise on Ravelry? Please let me know. Please feel free to advertise Ravelraiser on your own blog, pointing folks either here or to the thread on Ten Lousy Bucks. Come over to this thread after you've donated to talk about why you did so. Was it a particular prize? Something you love about Ravelry? Was I standing behind you, twisting your picking/throwing arm? (I can be such a bully.) 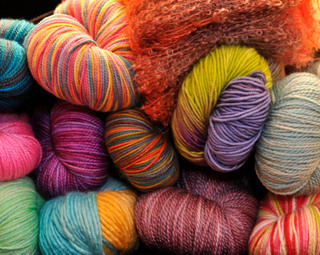 You can also read, there, a little personal story about why Ravelry has been important to me. Join up with the Ten Lousy Bucks folks while you're at it. We're nice! I owe a lot of thanks for all the help I received putting this together. To everyone who donated- your yarns took my breath away, and it was all I could do not to run off to Mexico with them once they arrived. But then, where would I get more? Good thing your stores are all linked in the Flickr set! To my dad, who photographed all of the yarn as it came in and in the process became a bit of a yarnie himself. He spent hours fretting over white balance. He showed up at my house every day to check for new packages. He endured taunting from my mom. Thanks, B-Bear! To Ashley, Kirsten, and Beth, who helped me solicit prizes. To Jared, for being first. To Jess and Casey, of course, who will keep track of donations. To Elizabeth, who helped me make an ad to run on the Rav. Now let's get together and Raise the Rav! Donate now!